5.11 Tactical Women's 8" ATAC Boot with Side Zip, Black | 500397, 5.11 TACTICAL SERIES, 5.11 Tactical Women's 8" ATAC Boot with Side Zip, Black | McDonald Uniforms, Inc. The 5.11 Women's ATAC 8" Side Zip Boot is perfect day to day patrol boot. The YKK side zipper allows you to quickly get into and out of your duty boot. Once you've tied the boots up, you'll just have to activate the zipper and you are good to go. The 5.11 Women's ATAC 8" Boots are perfect day-to-day patrol boots. 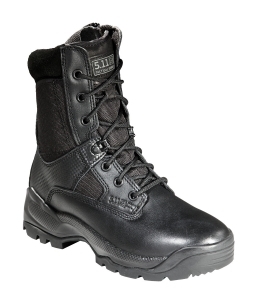 Also, the YKK side zipper allows you to quickly get into and out of your duty boot. Once you've tied the boots up, you'll just have to activate the zipper and you are good to go.